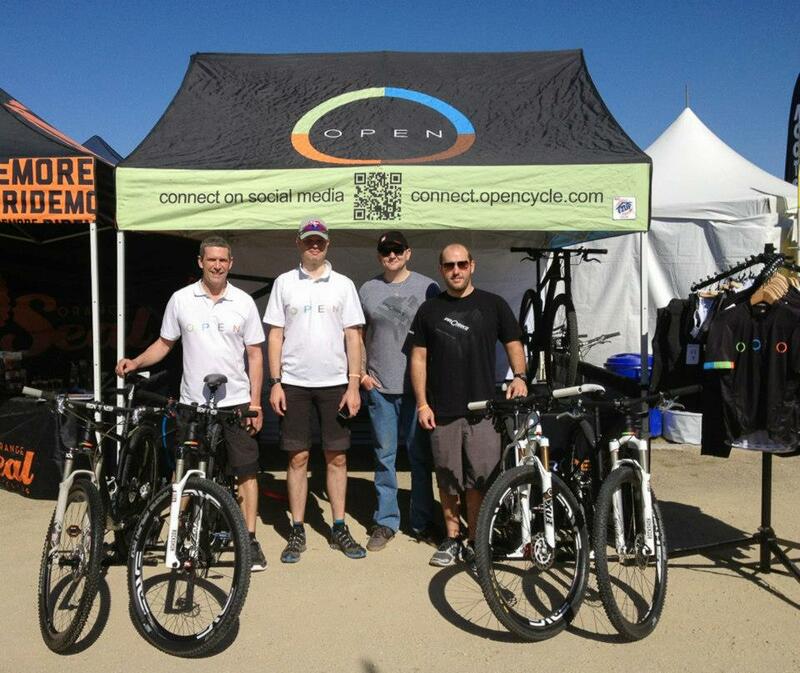 After last year’s launch of OPEN at SeaOtter, this year’s event was quite different. While last year, media attention was very high to check out the new kids on the block, this year media attention was matched by consumer interest. The expo at SeaOtter is never crazy-busy, at least not what you would think when you hear that 60,000 show up during the four days. Whenever and wherever you look in the expo space, there is good traffic but nobody will mistake it for a Japanese commuter train. To me it seems that many people just come to race and then immediately pack up and go home. I was amazed at how many people had heard of OPEN already, which obviously was quite exciting for me. The people who stopped by the booth really knew a lot about us already, and the AXX1 & The Electric One were both very well-received. The number of industry big-wigs was very high. This has become a networking event for many. While I abhor networking, I did have several very fruitful meetings, and you will hopefully see the results of this in the future. Props to SeaOtter for making the event so family-friendly. The number of kids on bikes was truly astounding, and the 3-year olds with full-on helmets bigger than the rest of their bodies are hilarious to watch (in fact it’s even funnier when they try to be “cool” by hanging the helmet on their handlebar, as the weight is so enormous they cannot possibly steer their bike straight. The number of 10-year olds with bikes that must have cost at least 50 years of allowance was also amazing. But most of all, it was great to see how much fun these kids were having, both in the cycling events and the other expo entertainment. Lots of new product introductions, lots of 650b stuff, and just like before most industry people have no idea where this trend is going. It’s amazing how virtually everybody introduces 650b products just because others are and because they don’t want to miss the boat, and how few manufacturers actually know why. There are some who do, don’t get me wrong, and even I believe in it for certain specific cases (basically when bigger wheels won’t fit due to frame size, suspension travel or frame configuration), but they are few and far apart. You can also see it in the justifications brands use for their 650b product – it rarely makes sense. That said, I think 650b is here to stay. Together with the 29er it will be the standard going forward, and the 26″ wheel is truly history. Will OPEN ever make a 650b frame? If there is a good reason to do so, definitely. If not, then not. So far we don’t have a frame design coming up that requires 650b wheels, although one design comes pretty close. So who knows, it’s still so early that design changes could push it over the edge, it’s hard to say. But definitely nothing coming soon, we have no desire to simply join the stampede. Despite all the mountain bike introductions, I think the biggest news was on the road: the introduction of SRAM’s new groups with 22 speeds (11-sp cassettes) and hydraulic brakes. Their hydraulic rim brakes are gorgeous, and seem to work very well. The disk brake versions will be interesting to follow, especially to see what the UCI decides to do. The levers have received mixed reviews, the taller dimension makes them less elegant than the old designs. But you have to put the hydraulic cylinder somewhere, and the taller hoods actually give you a great grip and some room to move your hands around. Great for long rides and also great for more security in tricky situations (think cyclocross). I come out of SeaOtter with a lot of drive to push forward on our new designs. The meetings I had were just what the doctor ordered to make good headway, and I think we’re on the right track to bring out some really nice things. Nothing in the near future, this is all still pretty far away, but I’m excited about it. At SeaOtter from left to right: Andy, myself, Jason and Mark (both from our Newport Beach retailer Pro Bike Supply). This entry was posted on	April 23, 2013 at 13:59	and is filed under bike equipment. Nice one Gerard, did you see Kennett Peterson do his jumps? How about a time trial/dirtjumping bike?? Reckon there’s much mileage in it!? Maybe not exactly our market. I caught a small portion of his tricks I think, I was running by getting back to our booth but wasn’t sure who it was at the time.